This summer, while on her UK jaunt, Jessica fell in love with the creative force of Úna Burke. Úna takes leather to a whole new dimension. She crafts subtle Italian leather into body morphing silhouettes, then pairs the leather with gorgeous Italian gold-dipped Italian fittings. 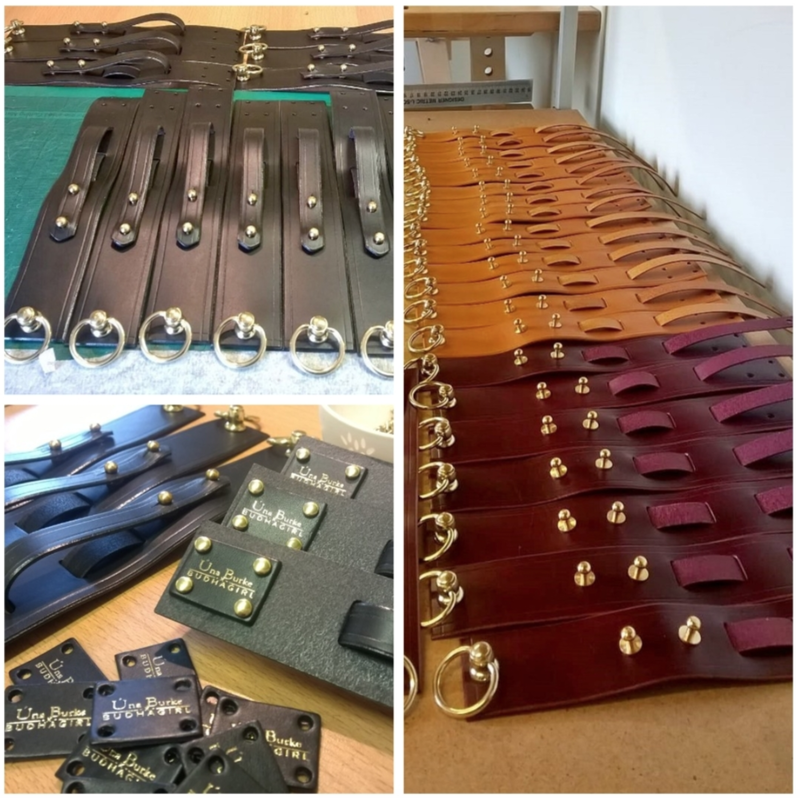 We recently unveiled our exclusive Úna Burke Collection, and today, we're talking with the talented designer about her leather masterpieces and her creative process. 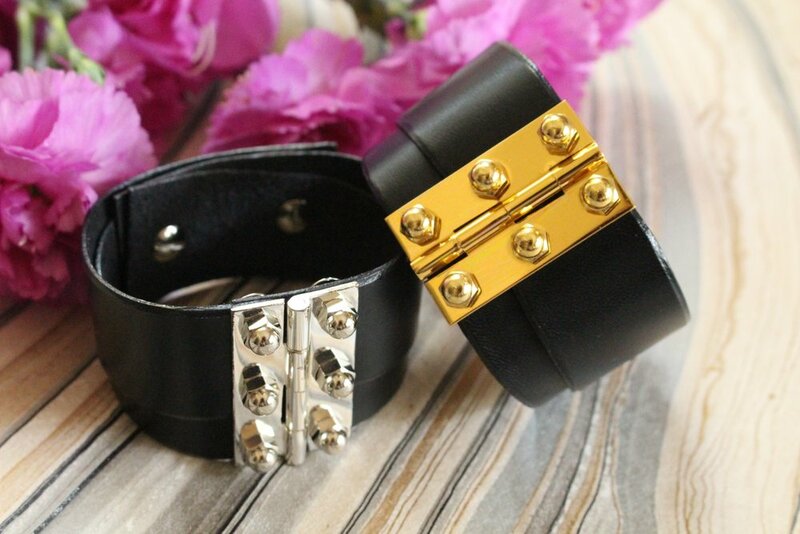 BuDhaGirl: When did you start making leather accessories? Úna Burke: I first began by creating contemporary figurative art pieces using traditional leather-working processes. These were very armor-like in their construction and I was invited to show them at London Fashion Week in 2009. Realizing at this point that there was a demand in the market for more wearable versions of these art pieces, I began developing belts, jewelry and handbag styles crafted using the same unique style. BDG: Where were you trained? UB: In 2003 I completed a BA in Fashion Design at Ireland's Limerick School of Art and Design. After a few years in the industry I decided to return to specialize in leather-working so I studied an MA in Fashion Artefact at the Cordwainers Department of London College of Fashion. BDG: How would you describe your jewelry style? How would you describe this season’s pieces? UB: The mood of my pieces is always one of strength. My underlying inspiration is military armor and so these pieces can be quite androgynous depending on the leather color. Our customer is fearless and has a tenacity, not always needing to be shown but ever present nevertheless. This season we have a range of larger and smaller bracelets in black, merlot and caramel, all styles are sizable and are worn by both men and women. BDG: How does your creative process work? What’s your favorite part of designing jewelry? UB: I work in a very hands on way, so rather than starting with a sketch, I will cut the leather into small panels and then twist and turn it around the body to create pieces which fit perfectly and have very unique aesthetic. I most enjoy playing around with the leather, letting it lead me on a journey of discovery, and I love how each of the hand-making processes is so methodical and meditative. BDG: Where do you find your inspiration? UB: I am mostly inspired by people and especially by the strength of the human spirit. I look at military references as visual representation of this strength and this leads me to create a style of work which has a powerful quality. BDG: Which person (past/present) do you think has/had the best jewelry? UB: Iris Apfel wears it best without doubt, and Carole Tanenbaum has the best collection. BDG: In your eyes, who is the quintessential BuDhaGirl? UB: I couldn't put her down as one particular person, but I believe the BuDhaGirl woman to be smart, savvy, self-aware and intuitive, much like the Úna Burke woman, which is why our collaboration makes sense.